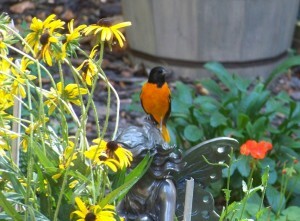 Joe and I enjoy watching and feeding the birds here. We could not keep from turning into avid bird watchers after we moved into our home in the woods years ago. Colorful birds would fly past our windows and our curiosity got the best of us. We had to find out what those birds were. We have always relied on our faithful bird guide, Roger Tory Peterson’s Field Guide to the Birds, to identify our feathered friends. I know some very nice bird identification software is available today, but we still like to use the Peterson paperback. It has served us well, is very portable and is much less expensive than the software. Not to brag, but Joe and I have become fairly adept at recognizing birds by just hearing their song. About 95% of the time, when we hear a bird sing, we can identify the bird without ever seeing it. This comes in very handy when there are many leaves on the trees. 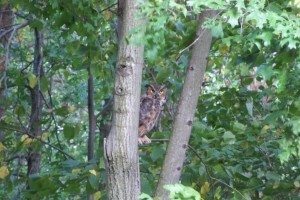 We have seen over 130 different birds and water fowl on our lot over the years. And even after all these years that list keeps growing. 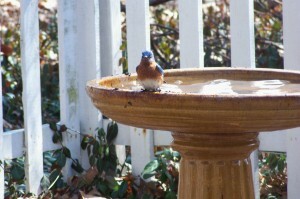 It seems that every year we see a “new” bird or see some of our regulars doing some unusual things. It is something we have come to look forward to and is one of the great things about living where we live. This year has been no exception. Our newest bird discovery, new to our life list of birds, is the Dickcissel. We were taking a walk last week and heard a bird song that we had never heard before. The song was coming from droves of birds that were flying around in a wheat field down the road. This wheat field, which has evidently become their nesting ground, also has a few other plants growing in it. There are also some pink weeds, some yellow weeds, and what appears to be a few assorted crops. We were able to get a good look at the birds with the binoculars and Joe finally identified them with our trusty field guide. 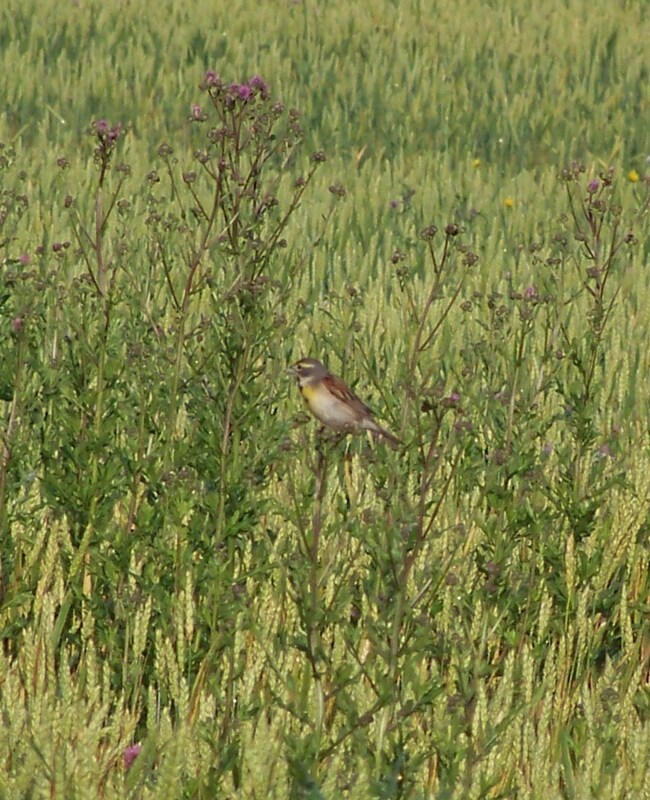 According to Peterson, the Dickcissel looks like a small Meadowlark, about the size of a House Sparrow. 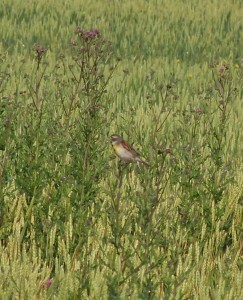 It is a grassland bird with a fondness for alfalfa fields. Apparently there is also some alfalfa in that wheat field. It was difficult to get a good photograph of this bird and I posted the best photo that I took. Wikipedia has a very good photo of the Dickcissel. This year the Baltimore Orioles are finally using our Oriole feeders. 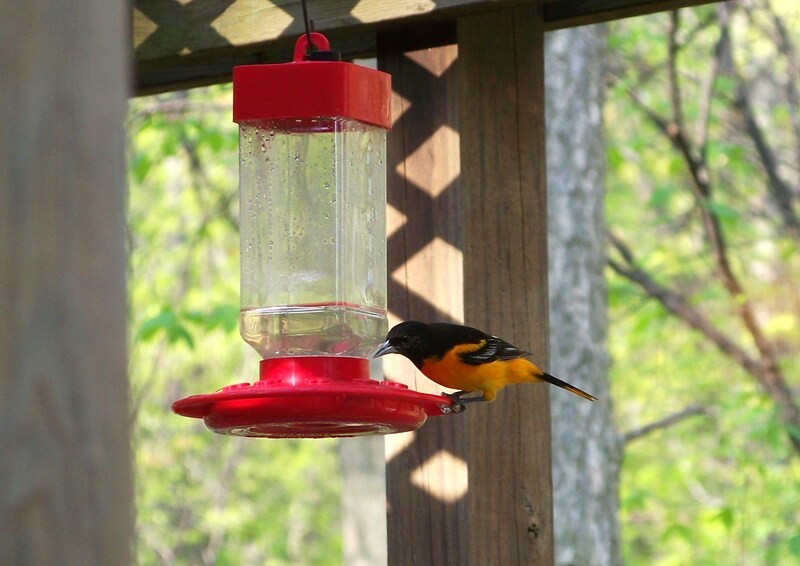 Joe puts those feeders out every year but the Orioles have ignored them until this year. Early this spring Joe saw a male Oriole trying to use the hummingbird feeder. 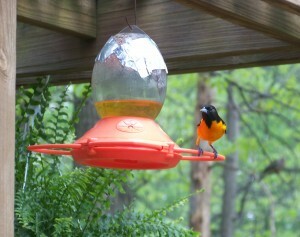 Joe quickly put out two Oriole feeders and two pairs of Orioles have been using the feeders ever since. 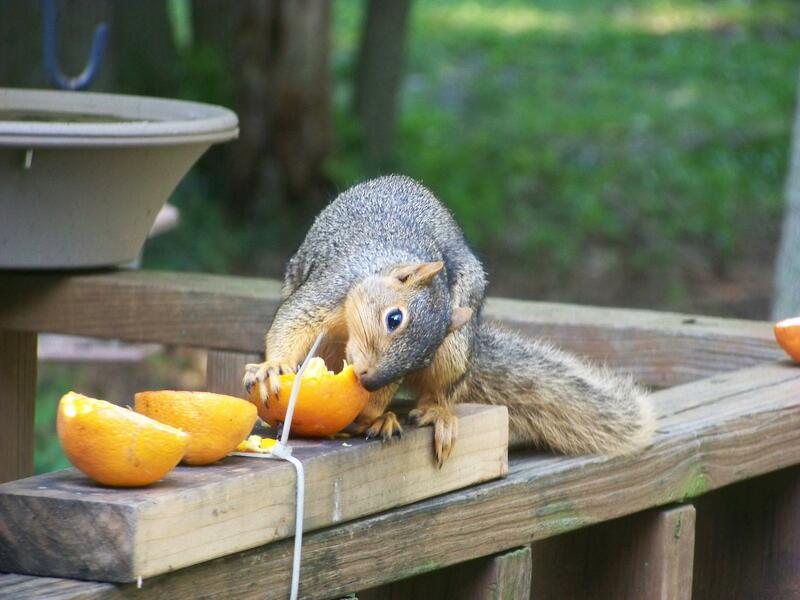 The Orioles also like to eat oranges, as does a fox squirrel. 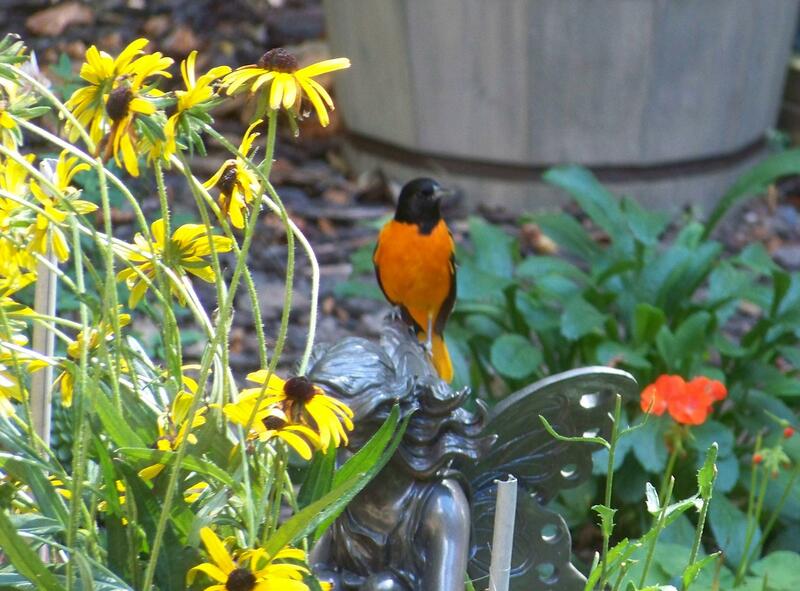 We always see at least one or two Scarlet Tanagers in the spring and one stopped by one of our bird baths a few weeks ago. I have never been able to get a photograph of them, so you will just have to take my word that we have seen them here. 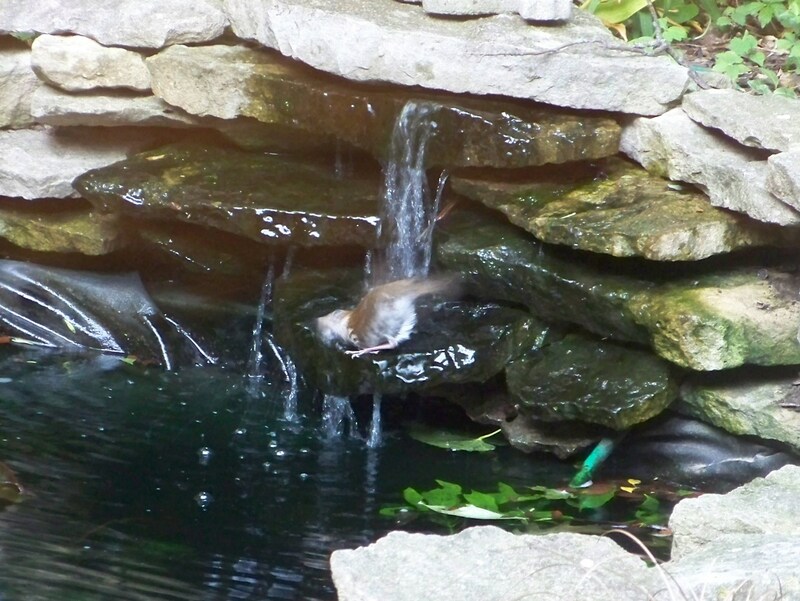 They seem to be attracted by water and like the little waterfall on our goldfish pond. 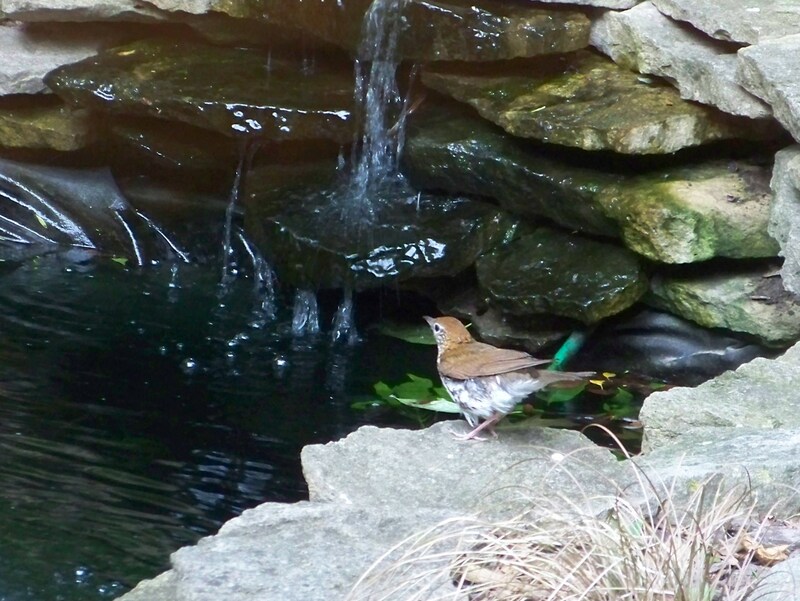 A Wood Thrush also likes our waterfall. They seem to be a rather elusive bird but the sound of water must have been too much of a temptation for this one. After several hesitant attempts he successfully learned to shower under the waterfall. They have a delightful song that I love to hear coming from the woods. We call them the “ee-o-lay” bird since that is what their song sounds like. Their song has been described as one of the most beautiful songs of the birds in North America, and I agree. 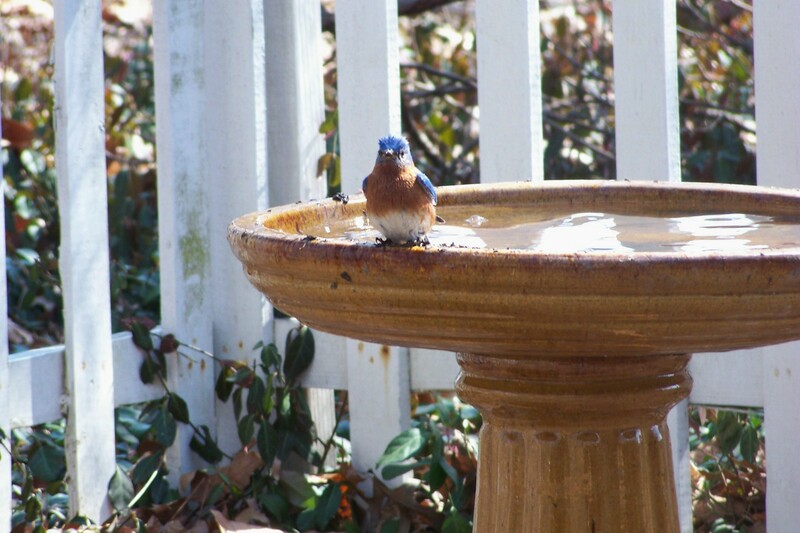 Some of the other noteworthy birds we have seen here over the years include Bobolinks, a Great Horned Owl trotting (more like waddling) across the front yard, a Great Horned Owl drinking from our pond, a Great Blue Heron standing in the goldfish pond (eating the goldfish and Koi! 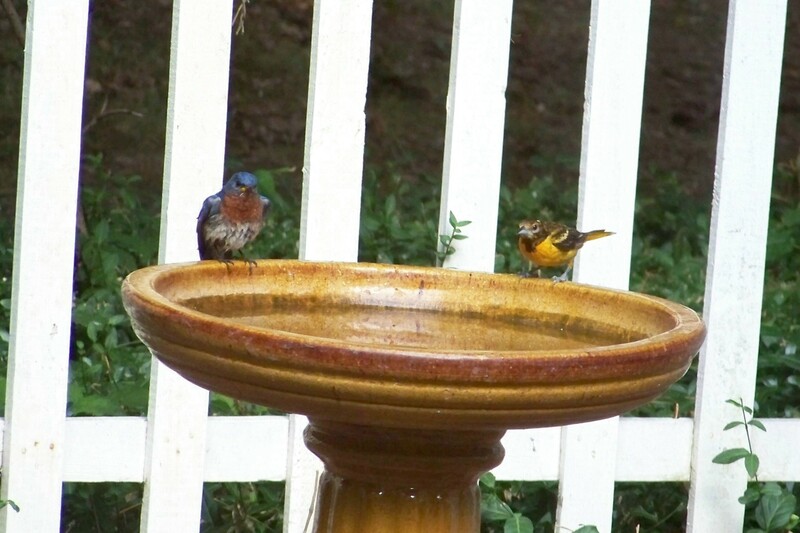 ), two Scarlet Tanagers on a bird bath at the same time, a wild turkey walking about on Memorial Day (the wrong holiday for him), a Ring-necked Pheasant strolling through the front yard, a Bobwhite Quail that I called in and that landed about 10 feet from us (much to Joe’s surprise), Blue Grosbeaks, a Rufus-sided Towhee, and a Virginia Rail. Then there was the little Screech Owl that would fly into our patio door at night, hoping to snag one of our parakeet for his evening meal. We eventually had to cover the parakeet cage with a towel so the owl wouldn’t knock himself out on the glass. I enjoy photographing the birds and wildlife, although it can be very challenging. #1, I do not have the best camera for the task. #2, these little critters move around quickly and don’t stop to pose for me. #3, wildlife photography can be very time consuming and requires a lot of patience, neither of which I seem to have enough of these days. But, I have taken a few fairly decent photos of our birds. Maybe some day I will have the camera of my dreams. Until then, I will enjoy the photos I have taken so far. Last year, as a Christmas present for Joe, I had our yard registered as a National Wildlife Federation Certified Wildlife Habitat. As required for certification, I indicated that our property provides the four basic habitat elements needed for wildlife to thrive: food, water, cover, and places to raise young. We have a nice metal sign that shows our certification. 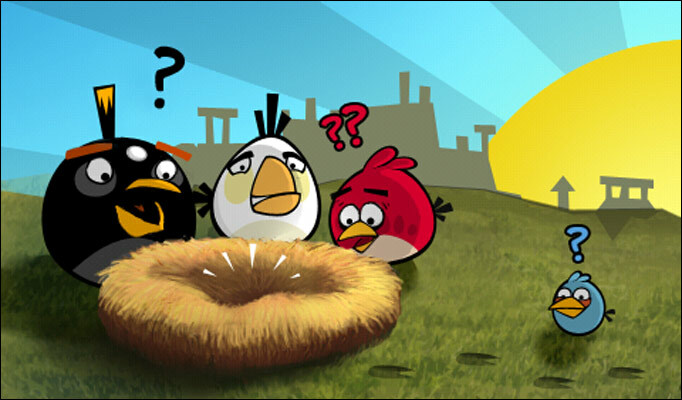 Those look like Angry Birds! 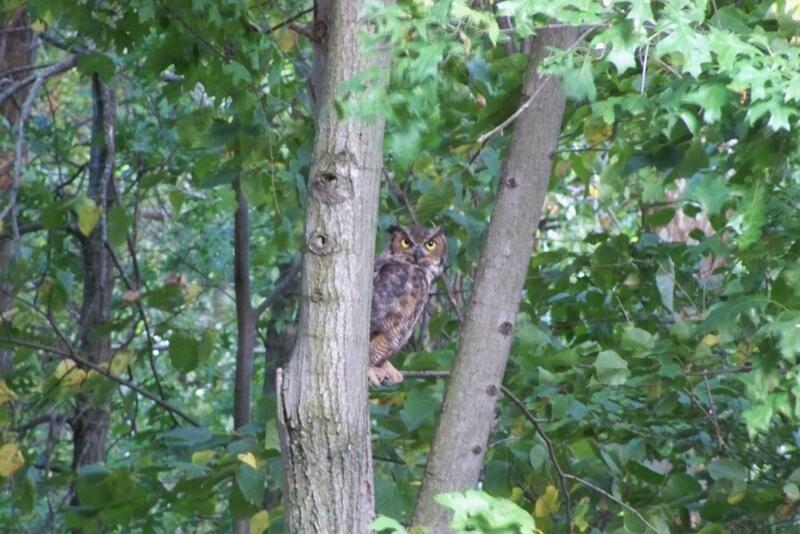 We have Happy Birds in Mercer County. Jeff, I wouldn’t let those birds get in your apartment. They look angry. What? 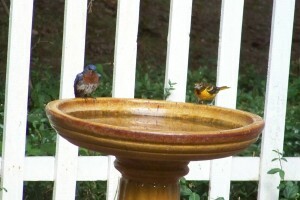 No house finches, gold finches or doves? Harris hawk, red shoulder hawks, red tailed hawks, sparrow hawks, Merlin, Coopers hawks, Barred owls or snowy owls? 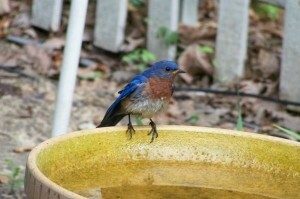 What about Indigo bunting? No mention of cardinals, blue jays or crows? Have you ever observed Sandhill cranes in the area? Just over in Indiana the migration of thousands of Sandhills is a sight to behold (see and hear).